Rare vintage Bollywood movie poster of the Hindi film, Kala Dhanda Goray Log (1986) for sale. This is an actual surviving old Bollywood poster of the 1986 Hindi film that featured Sunil Dutt, Sanjay Khan, Anita Raj, Akbar Khan and Amrita Singh. The title of film when translated to English means, “Black business, White people.” After the film’s release, this became a popular phrase to define corruption in high places. The film was Sanjay Khan’s last, post which he shifted to television. Printed and circulated a few years after the first release of the film (somewhere in the late 1980s), this movie poster was printed for publicity of the film but never ended up being used. This rare hand painted Bollywood poster features stunning hand drawn artwork. Typography used in the poster is primarily in English, with a translation of the title in Hindi at the bottom. 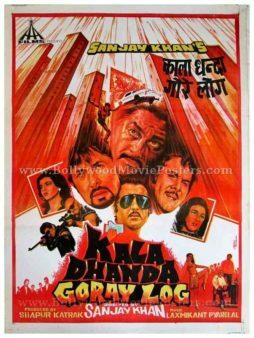 Kala Dhanda Goray Log is a 1986 action Hindi film directed by Sanjay Khan, starring Sunil Dutt, Sanjay Khan, Anita Raj, Akbar Khan and Amrita Singh.